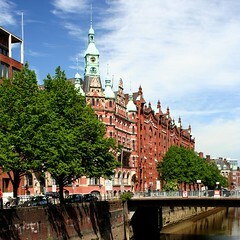 This port city on the River Elbe is Germany’s wealthiest city. It joined the Hanseatic League trading bloc in the Middle Ages and has been doing business with the world ever since. Hamburg has been Germany’s maritime gateway since the 12th century, which explains its cultural diversity, culinary highlights, excellent shopping and pulsing nightlife. Europe’s second largest port boasts 40 theatres, 60 museums, 100 music venues and clubs, and around 2.300 bridges – more then Venice and Amsterdam combined. Head for the port and take in the unique atmosphere of the 19th-century St-Pauli-Fischmarkt (fish market). On Sunday mornings a lively street market springs up around it. The noisy stallholders with their humorous banter add local flavour, while sleep-deprived revellers and early birds breakfast on fish rolls accompanied by jazz bands. Many people come simply to enjoy the sponatneous – and it has to be said, raucous – entertainment. The emigrant museum BallinStadt is another port attraction on Vettel Island. About five million European emigrants started their trip to the ‘New World’ from here between 1850 and 1939. Descendants of Hamburg emigrants can research their history here. The 132-metre-tall spire of St Michaelis church, which dates back to 1762, offers panoramic views of the port and city. You can climb it or take the lift. This baroque landmark also boasts Germany’s biggest tower clock with the clock faces over 24 metres in cicumference and the hands 4.91 and 3.65 metres long. (Englische Planke la; st-michaelis.de). For designer stores, head to the ritzy shopping streets of Grosse Bleichen, Neuer Wall, Jungfernstieg and Ufer Strasse plus there is the upmarket Eppendorf suburb. The Karolinenviertel features the work of up and coming designers. The more affordable Mönckebergstrasse has more then 100 shops and department stores.